Does anyone else see death flags over Mikumo? I guess she will eventually die so Freyja can take over her role. 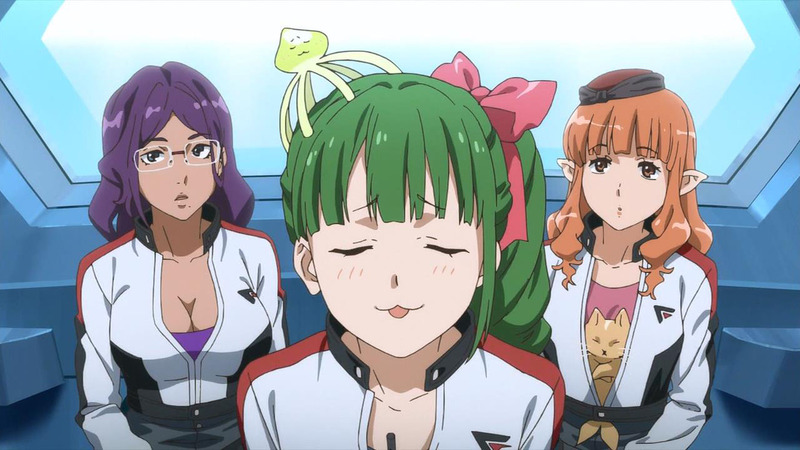 So episode two at the audition, was the purple haired girl the bridge bunny from Macross Frontier? Please no. I really like her, she's not had any time to develop as a character, and honestly I don't think Kawamori would do that, he's never killed off an Idol before and I don't think he's gonna start now. I hope not...I'm totally expecting a member of Walkure to fall. Freyja gonna die. Love triangle resolved by death. Then she comes back in the movie, and things get awkward. If anyone has pineapple salad flags, it's Kaname and/or Messer since there seems to be some UST between them. I know it goes against everything that has ever happened in Macross up to this point but could we please NOT have a likeable character die this season? I still haven't gotten over killing off Michael in frontier. Maybe they've wised up and banned unbaked pineapples and steak. Still cryin' for Focker and Kakizaki here, man. The loss of Lt. Kinryu is still felt to this day. But man, what a way to go. Member of Tactical Sound Unit WALKURE and by far the frilliest, she is the team’s mechanic specialist. Has a tendency to name and fawn over mecha that she particularly likes. Is close to fellow WALKURE member Reina in an almost sibling-like manner. The two also live together. you know, the more I think about it the more i realize that Makina is basically Super Sonico with giant robots instead of cats and that's awesome. I'm thinking at least one of the Windermere Knights will also buy the farm. Maybe the older looking pilot who doesn't have a profile yet? He's a minor character and doesn't have the visual esthetic that female anime fans like, so killing him off is relatively unproblematic. Scarred man? Yeah, he's up for the plot-axe. Those scars are probably from some pineapple related allergy. Suddenly made me think abt xmen's scott-jean-madeline when you mentioned resurrection...then freya becomes dark freya! Truthfully? 90s first-person shooter Shogo: Mobile Armor Division was my muse for that last sentence. It took an act of will not to start reworking game text into something plausibly Delta-sounding. Shogo...yea that was rocking! All i remember was pretending i was in a landmate ala appleseed and blowing robots away! You need to host that image on a site that allows hotlinking, like Imgur. What're the names of the new Bridge Bunnies? BTW...the bridge of the Elysion is HUGE...I wonder who's manning the forward stations. I'm not seeing death flags on Mikumo just yet. I'm also not sure that she's an android/implanted up/clone type necessarily. Looking at this (slightly NSFW) official art https://danbooru.donmai.us/posts/2326797?tags=macross_delta her hair design seems to suggest mermaid like fins. Could it be that (since nobody seems to know where she lives) that she's from Ragna and she lives under the sea and we just haven't seen her gills yet?? Edit - and the last bit of her name is "mer" - coincidence? Or am I reaching?! well her poster has additionally what looks to be leafs sprouting from her hair. Some form of sentient nature being that is in tune with the planet? There looks to be a glass shards too at the bottom, suggesting maybe she was bio enginneered in a tank? (from left) Beth Muscat, Mizuki Yuri, and Nina O'Brien. Where was this info given out (and where can we acquire it if it isn't on the net)? EDIT: That means that we have at least two Sailor Soldiers (Mikumo is Sailor Jupiter in PGSM Crystal) in the cast. Going through it right now. Anyone know how the some of the names are to be romanized (e.g. Heinz's second name which reads as "nerihi")? EDIT: Can we safely assume that Guy Geargood(?) and Harry Takasugi are those two other guys in the tram in episode 2? I don't know how her middle name should be spelled, so I'd wait until the official site posts her character info. You can try Google Translate, but it's a hit-or-miss. Most likely. Tried a Google image search with their names, but found nothing. Guess we'll just wait until the next episode. Rewatched episode 2 and 3, the two guys on the tram seem to also be the two guys working on Mirage's plane earlier on. They're also seen in the group of mechanics with Freyja at the end of episode 3 (standing right beside her at that). 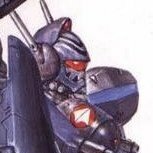 Japanese wiki lists a new character under the Aerial Knights section named "Qasim Eberhart" voiced by Shinnosuke Ogami, as well as a "Guramia VI" voiced by Masaki Terasoma.